I was born in Rheinfelden but I grew up in the Netherlands. My working experience comes from my work in different companies: assembly / removals by UTS, Wijchen, gardener at Grobuva, Nijmegen and mechanic assistant for gas, water and electricity at Lestrade, Arnhem. Since 2007 I'm back in Switzerland. 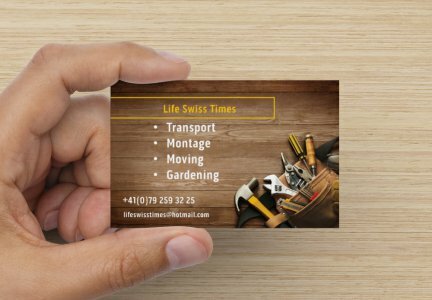 With many years of experience as truck driver and mover I start my own company "Life Swiss Times" in Elsau, Switzerland. I would like to help you with my professional experience, to avoid stress and pressure concerning your removal, so you can enjoy your new home from the first day you move in: I take care for the transportation of your furniture, the montage and assist you with your removal as you like. My moto is therefore: Don't dream your life, live your dream.